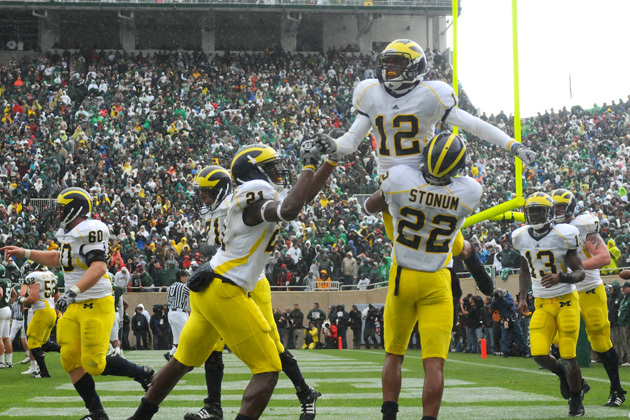 The 2010 Michigan offense features great depth and experience at receiver, slot and tight end. I'm not going to go all Gerry DiNardo and claim that the WRs are the biggest bright spot on this Michigan team, but it is clearly an area of great promise that has the potential to have a breakout type season. Most projected contributors have seen abundant playing time over the last 2, or more seasons. Expect to see a vast array of lineups throughout the season at WR and slot. Players will intermix between those two positions frequently. However, Michigan is still a run-first type of offense, so the receiver role is still one that requires good downfield blocking ability. Roy Roundtree was the leading receiver in 09 with 32 catches and 434 yards and 3 TDs. #2 overall was outgoing senior Greg Matthews with 29 catches for 352 yards. The good news is that #3 through #6 in receiving are all back. Martavious Odoms, Junior Hemingway, TE Kevin Koger and Darryl Stonum all looked good in the spring and continue to look good in fall camp. Since Rodriguez came to town, Michigan hasn't had a receiver crack the 500-yard barrier. Before Rdoriguez, we always had at least 1...or 3 receivers over 500 yards per year. Part of that comes from having inexperience at QB for two years in a row. The other part of that is Rodriguez's offenses have never featured a downfield type of passing attack. But Michigan finds itself suddenly in a position where it has talent to burn at both WR and slot. I'm excited to watch guys like Jeremy Jackson and Ricardo Miller in this offense. Martavious Odoms has always been a solid contributor, and Kelvin Grady, Je'Ron Stokes and Terrance Robinson could all have breakout years. Even if one of these guys separates himself from the pack, we'd be in great shape. Put it simply...the best friend of a young QB is a receiver that can make big plays. The other best friend of a young QB is a big TE that can catch. We have that too with Kevin Koger and Martell Webb. Our receivers are fast, can make plays and will be able to assist the running game by blocking downfield. The last position on the field that I am concerned about is this one. Like I said, this bunch of talent is simply too good to not have a good season.